Incident at Kilpatrick station in West Dunbartonshire on Sunday afternoon. A woman has died after being struck by a train at a railway station. The 32-year-old was hit at Kilpatrick station in West Dunbartonshire at around 4.50pm on Sunday. She died at the scene. 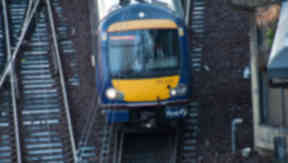 A spokeswoman for British Transport Police said the woman appeared to have jumped from the platform into the path of the train in the village of Old Kilpatrick, near Dumbarton. A ScotRail spokesman said the woman was hit by the 4.25pm service between Helensburgh Central and Edinburgh Waverley, and replacement buses were put on for customers as all westbound services to Dunbartonshire had to be terminated at Dalmuir. The line re-opened as normal shortly after 9pm on Sunday.